Rodman Flender has worked in film, theater, documentary and television. 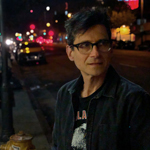 His genre directing credits include Dimension TV’s Scream, the TV Series; HBO’s Tales From the Crypt; The Roger Corman-produced feature The Unborn; and Columbia Pictures’ Idle Hands. He recently wrapped shooting the horror-comedy Eat, Brains, Love for production company Gunpowder & Sky. He has lectured on television directing at USC’s Peter Stark Producing Program and film analysis at Harvard University.